It's Scorpio time! Happy Halloween! We have a mutable Pisces Moon for the holiday and this is when the 'veil is thin'. Scorpio and Pisces are an intuitive, mysterious match that lend well to your costumes, disguises and psychic experiences. The Moon is waxing toward Full in Taurus at 1:23 am on Saturday. By Wednesday night we'll be feeling the intensity. Sunday: Aquarius Moon void from 12:22 to 7:46 pm (adjust for your time zone). Early hours are for action on those things you've been talking about and not doing or resolving. Pisces Moon 7:46 pm EDT. Green is today's color. Monday: Pisces Moon aligns with the Sun and Jupiter in Scorpio and meets Neptune. Intuitive, creative, and emotionally attuned. Light Blue. Tuesday: Pisces Moon void of course 5:06 pm EDT. Adjustments and minor changes. Keep flexibility in your mind and your schedule. Void of course hours affect judgement so keep your wits about you. Intuition and metaphysical experiences heightened. Orange is today's color. Wednesday: Aries Moon begins 2:43 am EDT and opposes Mars. Contentious situations heat up. Compromise and consequences. Red is today's color. Thursday: Aries Moon opposes Venus and aligns with Saturn. Uranus and the Moon join forces in Aries. Forceful and determined energies in play. Relationships, equality and justice themes. Void Moon 11 pm EDT. Brown is today's color. (red browns are best). Friday: Taurus Moon begins at 5:46 am EDT and will be Full overnight into Saturday. Strong finishes. Complete, resolve, stand your ground, stay committed. Decisions made now will be difficult to reverse or change in the future. Today's color is Yellow. Saturday: Full Moon in Taurus. Venus opposes Uranus affecting relationship dynamics and legal situations. White is today's color. Happy Halloween! Enjoy my Halloween playlists on Spotify! Here's one. Advance sign up so I can research your Moon sign and more. November 19th on a Sunday 12-1:30, this class will be held at Scarborough Yoga. Meet the new Yoga collection from doTERRA. They're delicious and align with the signs. Discover something new. Gentle Yoga poses and oils for air, water, earth, fire, cardinal, mutable, fixed signs. Sunday, November 19th at Scarborough Yoga link to register is here. Email me with your birth info. As this week begins, Mars shifts to Libra and the Sun to Scorpio. Sunday: Mars to Libra at 2:29 pm EDT. Libra is harmony and justice, Mars is forceful energetically. Efforts toward peace must be measured. Mediate, work through or with an independent party like an attorney rather than confront volatile personal or business situations head on. These are weeks to avoid the tipping point where dominance and power override logic and sensibility. Sagittarius Moon in harmony with Mars. Red is today's color. Monday: Sun shifts to Scorpio at 1:27 am EDT. Sag Moon in harmony with Venus in Libra and square to Neptune. Trust your intuition if you think someone is misrepresenting or holding back secrets or important information. An adventure is appealing, but avoid escapism of the long term nature. Indigo Blue today. Tuesday: Sag Moon meets Saturn in the morning. Use wisdom, make a decision or agree to terms. Void Moon 12:44 to 8:12 pm EDT. Rapid developments. Mercury and Neptune align for fiction writers and creative projects. Capricorn Moon 8:12 pm EDT until Friday. Light Blue is today's color. Wednesday: Capricorn Moon lines up favorably with the Sun, Jupiter and Neptune. Look for ease even in challenging situations. Make agreements and follow through on plans. Abundance and productivity. Green is today's color. Thursday: Capricorn Moon meets Pluto, Sun and Jupiter meet in Scorpio. A mixed day where focusing on the positive is necessary. Don't allow your confidence to be shaken. Show your best side and celebrate results. Gray is today's color. Friday: An overnight Moon square Uranus can be rough and involve power plays, competition or throw a wrench in well made plans. Venus and Mercury both interact with Pluto. Nothing will be taken lightly. Deep emotions evoked. Void Moon 1:22 to 8:59 am EDT. Aquarius Moon through most of Sunday. Purple is today's color. Saturday: Aquarius Moon harmony with Venus, square to Mercury. Strong statements. Connect with your tribe. Venus adds joy and beauty to events today or tonight. Wear Turquoise. See the previous post for much more about this week's New Moon in Libra. As always, before New Moon, reconsider your intentions, clear, clean, and make way for what's to come. Sunday: Virgo Moon begins at 7:19 am EDT, Mercury in Libra opposite Uranus. Need for quick responses or decisions and on the spot answers or problem solving, at least temporarily. Brown is today's color. Monday: Virgo Moon, Sun sextile Saturn. Tend to your projects with patience and care. The sextile signifies successful completion. Navy Blue is today's color. Tuesday: From 7:27 am to 1:35 pm EDT the Moon is void of course. Moon conjunct Mars. Aim to be patient through frustrations and avoid blame and heavy criticism of self or others. The in between time may feel long or uncertain. Libra Moon follows and meets Venus for dates and acting in harmony with balanced judgment. Mercury changes signs, to Scorpio at 3:59 am EDT. Avoid rushing things or feeling urgency. Focus on calming and clearing. Today's color is Lavender. Wednesday: Libra Moon, Mercury newly in Scorpio meets Jupiter. Positive and beneficial influences. Strengthen in wisdom. Indigo is today's color. Thursday: New Moon in Libra at 3:12 pm EDT. Sun and Moon oppose Uranus. Awakenings and changes come in surprising ways. White is today's color. Read more in last week's New Moon post. Libra Moon void 3:12 to 9:41 pm EDT. Scorpio Moon follows. Friday: Scorpio Moon time for focus and strong intention. Moon meets Jupiter and Mercury. Agreements, opportunities and resolutions come with these conjunctions. Today's color is Dark Red, like Maroon, a Scorpio color. Saturday: Scorpio Moon aligns with Pluto stimulating what's mysterious, kept secret or needs an outlet for release. Allow for feelings and know when to let go of stored emotions in a healthy way. Black is today's color. I'll offer this special class at Scarborough Yoga on Sunday, November 19th. Sign up at this link. It'll be fun to get together! I'd love you to join us. New Moon in Libra on October 19th is opposite Uranus, the rebellious, inspirational, sometimes destructive planetary influence. Uranus tears down in order to re-create in a new, original way. Relationships and independence vs. joining forces are themes of this New Moon. 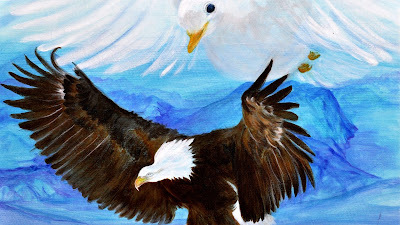 Sabian symbol for this New Moon, 'An Eagle and large white dove turning into each other'. This image of blending energies acknowledges two different qualities or ways or being. Polarities of Peace versus Force and The Hunter versus the Herbivore represent. Is cooperation a possibility even when the other party thinks and acts much differently from you? Can duality or opposing energies co-exist or even meld to form something stronger that each on it's own? The polarities are obvious and strong and continue the impacts of Jupiter opposing Uranus in early October just before leaving for Scorpio. The Wow effect, breaking free of restrictions or oppression and acting on out of the ordinary ideas and inspirations are some effects. Now with New Moon, it may be time to seek the next level, perhaps with a complementary energy, a supportive person or entity who thinks unlike you or comes from a different background, perspective, or strength. For New Moon in Libra, diffuse Serenity Blend and/or Lavender into the air or into your skin (with a lotion or oil carrier). 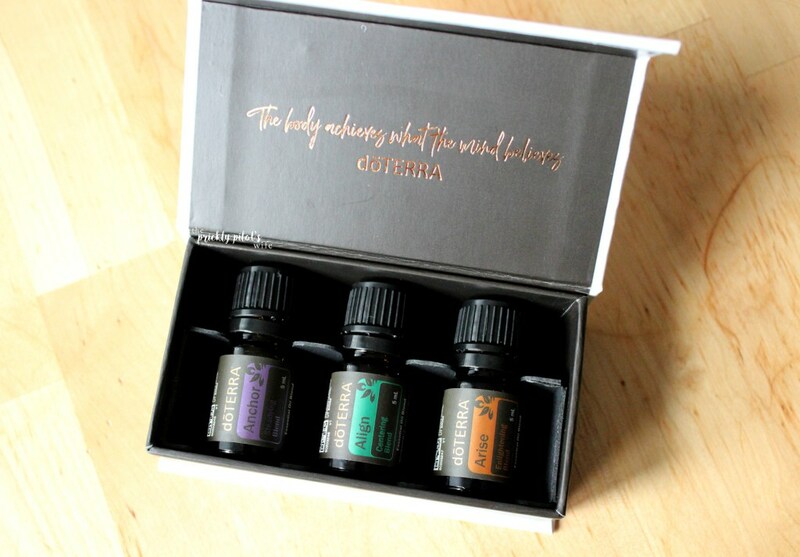 For more about doTERRA oils, see www.doterra.com/robinivypayton. October 26th, Thursday from 6-7:30 pm, come to Gentle Yoga and Essential Oils for the Zodiac Signs and find out your special blends and discover something new. In South Portland at Willard Beach Studio www.willardbeachstudio.com/workshops to register. Or take this class at Scarborough Yoga on Sunday, November 19th. I hope your Aries Full Moon was just fine. Being a fire sign, I was totally energized. As the Moon now wanes and we move deep into autumn, here are your colors and signs. Sunday: Taurus Moon void from 9:44 am to 9:45 pm EDT. Relax or do simple tasks and chores. Gemini Moon 9:45 pm EDT. Sun conjunct Mercury in Libra. Beware of overthinking that could prevent restful sleep. Today's color is Light Blue. Monday: Gemini Moon, Sun square Pluto. Progressive and restless with conflicting plans and opinions present. Lavender. Tuesday: Jupiter moves to Scorpio for a long term stay. Gemini Moon opposite Saturn. Void Moon 6:25 to 11:38 pm EDT. Make agreements and sign contracts before the void Moon. Business and communication liven up. Yellow is our color. Wednesday: Cancer Moon. Jupiter newly in Scorpio. Mars square Saturn can be very difficult. Emotions and abundance. Criticism and pessimism may be hard to temper. White is today's color. Thursday: Cancer Moon opposes Pluto. What are you working so hard to protect. Let go a little. Talk things out. Be careful of stories you tell yourself. Mercury and Saturn align for problem solving. Black is our color. Friday: Void Moon midnight to 2:41 am EDT, then Leo Moon. Fixed, persistent, stubborn energy and opinions-but they may be the good kind! Moon square Jupiter. How will you pursue and express what you feel most strongly for and about? Purple is today's color. Saturday: Leo Moon, Venus to Libra. Love and partnerships, social plans and events. Pink is today's color. Sunday is my Restorative Workshop, Restorative Yoga, Aromatherapy and Reiki with Addie Powers Johnson at Scarborough Yoga. Advance registration only and a few spaces left. Sign up here, today. Sunday: Mars trine Neptune. Aquarius Moon sextile (harmonious) Saturn in Sagittarius. You're on a mission. Today's color is Turquoise. Monday: Void Moon 7:13 to 10:26 am EDT in Aquarius. Pisces Moon as the business week begins. Add creativity to all you do. Forgiveness and loosening restrictions adds to ease. Full Moon warmup adds to the emotional tone. Green is today's color. Tuesday: Pisces Moon meets Neptune, opposes Mars and also Venus in Virgo. Venus trine Pluto. Relationship focus. Are you willing to meet yourself or others truthfully? That's today's 'work'. Wear Black. Wednesday: On this day before Full Moon, the Harvest Moon and Warrior Moon of Aries, clarify your feelings and pursue a goal. Bring something all together, full circle. Make peace with your self. Void Moon 3:19 am to 4:40 pm EDT. Personal priorities are #1. Understand today, act tomorrow or perhaps this evening. Hold within you both motivation and peace. Strongest intentions activate. Today's color is Orange. Thursday: White is our Full Moon color. Aries Moon is Full at 2:40 pm EDT. The sign of self, birth and rebirth, forging a new path, exploring all that is. See with new eyes. Accept yourself as is. Full Moon brings realizations, completions, departures, and movement. Venus and Mars meet in Virgo and relationships are a strong priority at Full Moon. That includes relations with colleagues and people you interact with every day. We need not be too judgmental or critical. Can you release some of that to see and experience a one on one relationship differently. Remind yourself not to take things personally. What are you a Warrior for? Love, Peace, or greed, maintaining the status quo, for growth or to conquer? Be mindful of what you might think, feel or do because of fear. Notice the paths opening to you. Let go of judgment statements that have held you hostage, and move freely. Happy Full Moon of Rebirth. Refer to last week's post for more on this Full Moon time. Friday: Aries Moon in harmony with Saturn. Finalize something with the spirit, energy and inspiration of the fire signs. There's a hopeful, motivated tone to this trine. Uranus and the Moon connect for speed and originality. From 6:38 to 7:56 pm EDT, the Moon is void. This short transition is highlighted by Jupiter opposite the Aries Moon one final time in this 13 month visit to Libra. This activates the Wow effect you read about late last week, all the relationship eventfulness, and all ways you're striving for personal and relationship growth. Taurus Moon moves in with resolve. Wear Yellow. Saturday: Taurus Moon. Create, build, plant. Feel the abundance of the earth. Green is today's color. Restorative Yoga with Reiki by Addie Powers Johnson and Aromatherapy is at Scarborough Yoga on Sunday, October 15th with a few spaces left. Nurture, regroup, feel supported. Sign up at this link. Essential Oils and Gentle Yoga Poses for your Zodiac Sign Thursday, October 26th 6-7:30 pm at Willard Beach Studio. Advance sign ups for this special class. 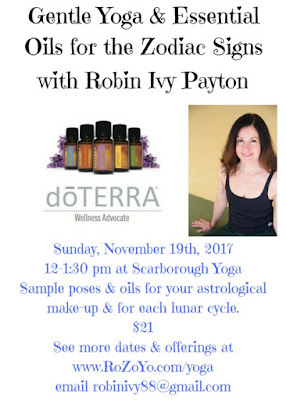 I'll also offer this Essential Oils and Gentle Yoga class at Scarborough Yoga on Sunday, November 19th at 12 noon. The oils or postures may vary. Come twice! Send a friend. Link up here. I have so much to share with you! Hope to see you soon if you're local to Maine or NH. To preview a bit of this including the Yoga Collection of essential oils I'm working with, link here. Have a peaceful, inspired Full Moon week.